It took us a while to hunt down a copy of Snowpiercer, since we wanted to make sure that we had the right version. There has been a lot of discussion online about how the movie's American release was somehow different compared to its original version. And when you deal with the wonderful world of the internet, there will always be many shadows possibly obscuring the truth. I haven't seen the original Oldboy yet, the other movie that really made director Bong Joon-ho rather famous within geek circles. And while I renew my commitment to get around to watching that particular work of art, in the meantime I found myself watching his more recent little masterpiece over the Holy Week. Probably not the best appropriate movie, but it's not like I'm all that religious either. It's hard to immediately describe how watching this movie felt like. I mean sure, there are the knee-jerk reactions to things, but the full experience is not something one can immediately put into words. And again, that's not a bad thing at all. If anything, it truly says a lot about the impact of the movie as a whole. 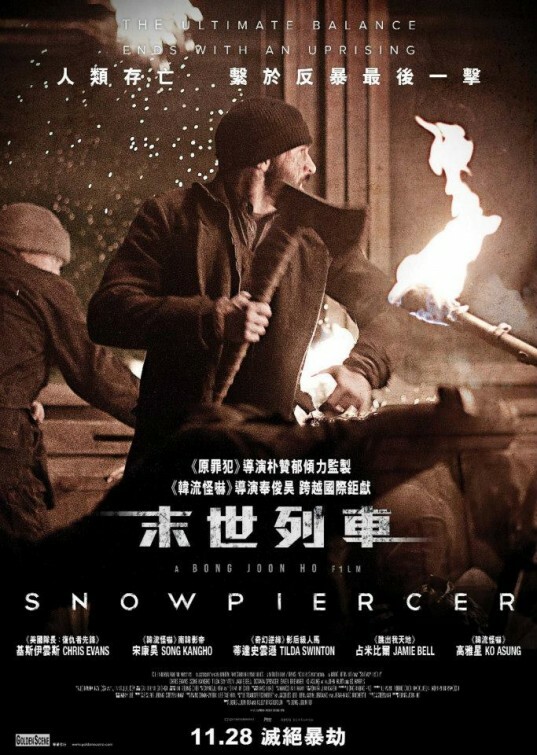 Synopsis: Snowpiercer is a 2013 South Korean science fiction action movie directed by Bong Joon-ho. The plot was adapted from the graphic novel Le Transperceneige by Jacques Lob, with the actual screenplay put together by Joon-ho and Kelly Masterson. In some not-so-distant future where the Earth seems to be trapped in some global ice age, we are introduced to the Snowpiercer - this massive train that has been running non-stop for some rears all over the world. The train contains what could be the only human beings left on the planet. But as is the way of people in an enclosed space, the residents of the Snowpiercer live in some rigid class system with those in the tail living in horrible conditions while those in the front live a life of extravagance. There have been a series of rebellions by the poor folks in the tail against those who run the train from the front. The leader of this latest rebellion is Curtis (Chris Evans) - although he may not necessarily own up to that role. The goal is to go all the way forward and seize control of the engine of the train thus gaining control of the train as a whole. It's a major goal and it will mean fighting across a significant number of train cars to get there. And all that the folks in the tail have to push them along is determination and a number of tools and blunt instruments as possible weapons. My partner and I couldn't shake off the feeling that they wanted to cast Christian Bale for the lead role of Curtis instead of Chris Evans. His recent fame in the Captain America movies usually triggers the image of his ridiculously over-sized physique in those movies. Here we have him all covered up in several layers of clothing in order to look a lot smaller (thus thinner?) than he actually is. Plus the rather gruff nature of the character and the need for a lot of intense stares makes it feel more Bale than Evans any day. He did a decent job, but there were certainly those moments when he didn't quite have the intensity to make this perfect. The movie features a lot of fighting, but it was all done in a manner that remained almost artistic at some moments. A lot of directors embellish and show us a lot of blood and gore. Here we have the elaborate fight scenes between the tail residents and the forces of the front, but at the same time you don't always see that cleaver going into a guy's head or something. Instead we see a lot of fighting, the random blood spray against the window but not a lot of the final moments. A lot of fatal gun shots or potentially gory scenes happen just out of view. We see the hammer raised, we know where it's going to go, but then the camera does not follow. And this still feels like a brilliant way to convey the intensity of what's going on without becoming campy. The world of the movie as a whole is just amazing - even if that world is just a train. The mythos behind it is so complete and so intriguing that it reminded me of other science fiction movies like Dark City for some reason. I guess because the world-building felt rich without the need for too much exposition. You're just sort of thrown into the mix of things and the story is designed in a manner that allows you to generally understand what is going on without going into too much detail. In this case, we have a train that runs on forever as the last bastion for humanity on a frozen Earth. Snowpiercer is a brilliant movie that has a lot going for it - great action, quirky characters and a powerful story. Sure it has its odd moments and not all characters get their time in the sun, but for the most part it's a very well-done movie. And thus it gets 4.5 interesting cameos in the movie out of a possible 5.